A Network SouthEast livery sandwich at Sevington on 2 June 1989. 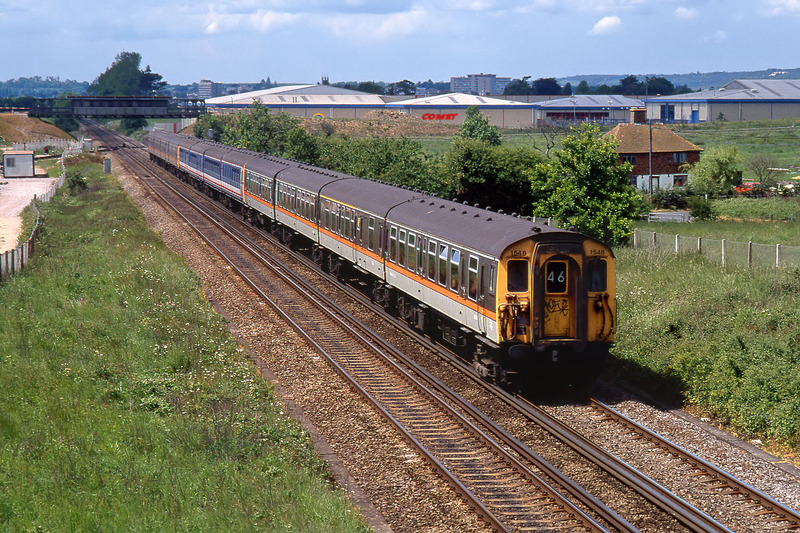 'Jaffa Cake' liveried Class 411 4-CEP 1548 heads the 12:30 Charing Cross to Dover Priory Network SouthEast service past the Channel Tunnel construction site, with a NSE unit and another 'Jaffa Cake' 411 bringing up the rear. The colour schemes pictured here are all now part of history, as are the 4-CEP units. Even the location has changed out of all recognition, with the high speed channel tunnel line running parallel on the right, making life in the small cottage even noisier!